Elephant poaching is nothing short of an international crisis. For decades, elephants have faced the looming threat of extinction as tusks are savagely ripped from their faces to satisfy the global demand for ivory. This illegal trade is fraught with corruption on every level, and profits benefit dangerous terrorist groups. A high level illegal wildlife trade meeting being held this week in Kasane, Botswana can develop solutions - if the international community is willing to accept responsibility for defining the future of elephant conservation. In the 1970s and 1980s, the population of African elephants was essentially sliced in half, from 1.3 million to a mere 600,000. This crisis led to a 1989 international ban on commercial trade in elephant ivory. The positive result of the ban was undeniable: ivory became taboo, markets dried up, prices bottomed out, poaching declined, and elephant populations began to stabilize. Unfortunately, this positive trend didn't last. In 1997, a limited trade of "stockpiled" ivory was approved for Botswana, Namibia, and Zimbabwe (and later, South Africa). Ivory flowed once again to Japan and China. Demand increased. Elephant poachers and ivory traders plied their deadly trade. Since January 2012 alone, more than 103,000 elephants are thought to have been slaughtered by poachers. And, official Convention on International Trade in Endangered Species (CITES) figures, just out this week, show that the rate of poaching has barely changed from 2013 to 2014. Because the rate of poaching exceeds the growth rate of elephant populations, we see an overall decline in their numbers. We will continue to see this dire trend unless we act now. Wildlife law enforcement agents cannot keep up or compete with well-funded, violent, criminal networks that poach elephants and move ivory. National security is threatened by terrorist groups selling ivory for weapons. Now, there is a renewed resolve at the international, national, and state levels to fight back to protect elephants, rhinos, and other imperiled species from the deadly scourge of international trade in their body parts. The US Fish and Wildlife Service has proposed regulations that would restrict trade in African elephant ivory and other related products. President Obama has convened an Advisory Council on Wildlife Trafficking. 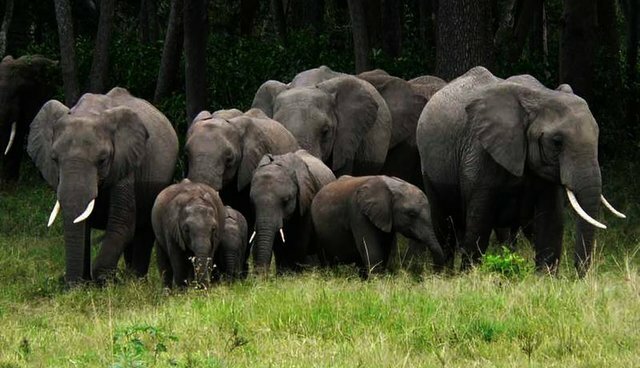 Last year in America, New York and New Jersey cracked down on the domestic ivory trade to ensure that these states no longer contribute to the decimation of Africa's elephants. California, Vermont, Massachusetts, Hawaii, Connecticut, Oregon, Illinois, and other states have also considered legislation that would ban the sale or trade of ivory and rhino horn. By acting at the state level to eliminate loopholes not covered by federal regulation, we can shrink the market for illegal ivory. Smaller markets; reduced demand for ivory; fewer elephants killed. Today, senior figures from governments around the world are attending a high-level meeting on illegal wildlife trade in Kasane, Botswana. The meeting is a follow-up to last year's London Summit, at which more than 40 countries signed a declaration to tackle wildlife trafficking by tightening up legislation, improving enforcement, working with local communities, and reducing demand. These efforts have helped, but not nearly enough. The global demand for wildlife products rages on. Poachers and criminal gangs continue to target vulnerable elephant populations, bringing elephants to the brink of extinction. The Kasane meeting provides an opportunity to assess current conditions and the impact of the actions taken to date, to identify actions still needed, and to determine how to move forward productively. Representatives from key countries absent in London are in attendance, including South Africa, Thailand, and India. The world is watching. We cannot stall; elephants have desperately needed our help for years. We must progress swiftly and decisively. For every day of inaction, nearly 100 more elephants are massacred. If we do not act, these complex, gentle, intelligent animals will continue to see their families torn apart for trinkets, grieving each loss with heartfelt pain. The matriarchal herds of grandmothers, daughters, granddaughters, aunts, nieces, and cousins, all living together for decades, are quickly becoming a scene of the past. At stake: the lives of hundreds of thousands of elephants, the future of their species, and - a risk too often overlooked - human safety. Last year, Born Free USA revealed the shocking relationship between poachers and terrorists in two groundbreaking reports, "Ivory's Curse" and "Out of Africa." These reports explore, in painstaking detail, the path from elephant slaughter in the African bush, to ivory collection, to export, to criminal syndicates, to final sale in Asian marketplaces. Elephant poaching is inextricably linked to violent militias, organized crime, and government corruption in central Africa, with profits from the sale of ivory directly funding the deadly activities of such high-profile terrorist groups as Janjaweed, al-Shabaab, and the Lord's Resistance Army. Only concerted and definitive global action will save the elephant and the rhino, and bring stability to the people who share their range. The US can lead the charge by completely abolishing ivory (and rhino horn) markets in the states. This would eliminate our role in this escalating crisis and hopefully encourage other nations to follow suit. Ivory prices have crept back up to an all-time high of $2,000 per kilo (approx. two pounds). It's not too late to control the situation; we can turn this around and once again prioritize preservation. Today's meeting in Kasane holds the potential to launch a positive future for wild elephants. The responsibility is ours.